(Bloomberg) -- The largest U.S.-listed exchange-traded fund tracking Saudi Arabian stocks sank Thursday as U.S. Treasury Secretary Steve Mnuchin said he was skipping an investor conference in Riyadh amid rising pressure to hold the kingdom's leadership accountable for the disappearance of a Saudi journalist. 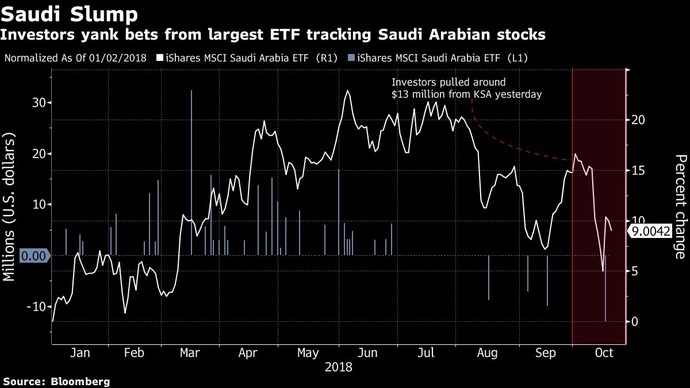 The $219 million iShares MSCI Saudi Arabia ETF, ticker KSA, started tumbling at around 10:30 a.m. in New York, eventually falling as much as 2.2 percent. The fund was down 1.6 percent in afternoon trading. Volume in the ETF has soared as well, with roughly 1.8 million shares worth around $50 million moving this week, almost quadruple the average weekly turnover for the past year. Investors are also pulling cash out, with KSA seeing nearly $13 million of outflows on Tuesday, the most since its inception in September 2015. The kingdom is under heightened international pressure to explain the disappearance of dissident journalist Jamal Khashoggi, who was last seen in September entering the Saudi Arabian consulate in Istanbul. The Saudi leadership has been accused of ordering his murder, but top officials have denied involvement in the disappearance and said they are investigating the matter. Media in the U.S. reported this week that the kingdom is considering saying he died in a botched interrogation. "This investigation regarding what happened at the Saudi consulate in Turkey is causing people to panic a bit about potential ramifications sanctions-wise on KSA," said Andy Wester, senior investment analyst at Proficio Capital Partners. "It's tough to invest in the market because of the governance and attitudes toward western investors." The crisis has reverberated across the Saudi business community, as high profile figures such as JPMorgan Chase & Co.'s Jamie Dimon and BlackRock Inc.'s Larry Fink also have pulled out of the kingdom's Future Investment Initiative event next week. And in a case of unfortunate timing, Franklin Templeton Investments, a long-time active asset manager, launched a passive ETF last week that tracks the performance of large- and mid-cap Saudi stocks. The Franklin FTSE Saudi Arabia ETF, which goes by the ticker FLSA, launched last Thursday, just days after news of Khashoggi's disappearance emerged. The fund was down 2.4 percent Thursday after gaining 2.2 percent on Wednesday. --With assistance from Tom Lagerman (Bloomberg Global Data).